I saw this lead question in a recent email I received: What is a good self-publishing company? The answer is simple: YOU. 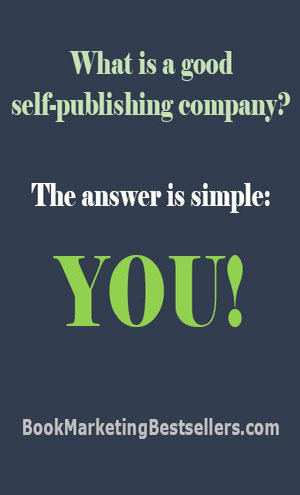 Yup, the only good self-publishing company is yourSELF. That’s what self-publishing is all about. I know that there are a lot of companies out there now that call themselves self-publishing companies. But the fact of the matter is that you can really only call it self-publishing if you do it yourself. Self-publish an ebook via Kindle (https://kdp.amazon.com) or Smashwords (https://www.smashwords.com). It doesn’t cost anything to publish ebooks through these services. You should always self-publish an ebook version of your book. 50% of all book sales are now ebooks. Self-publish a POD book (print-on-demand) using Ingram Spark (https://www.ingramspark.com). It will cost you a little to publishing via POD with Ingram Spark. This is a less expensive way to get started with a printed book that the following option but does cost a little more per copy. Self-publish a printed book using an offset printer like King Printing, Bang Printing, etc. You can find a list of offset printers at https://bookmarketingbestsellers.com/the-top-250-book-printers. It doesn’t pay to use an offset printer unless you are doing a print-run of 500 or more copies. This is the most expensive option, but the least expensive in the long run if you sell the books. Avoid 95% of the so-called self-publishing companies. If you do decide to go ahead with one of them, do not buy into any of their marketing programs. Their marketing programs are way over-priced and almost universally ineffective.